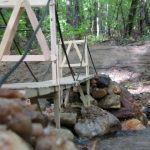 I have always wanted to build a model suspension bridge, and finally I have finished one. 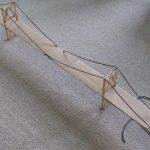 This is a popsicle stick suspension bridge. I created it from scratch, coming up with the design on my own. 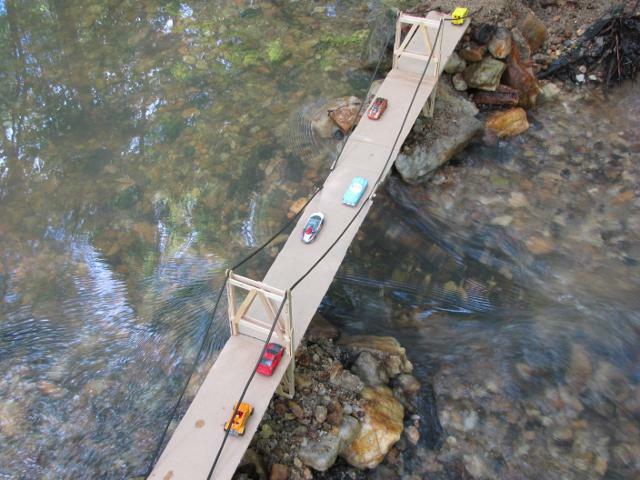 After testing it to failure I learned quite a bit about how suspension bridges react to loads. 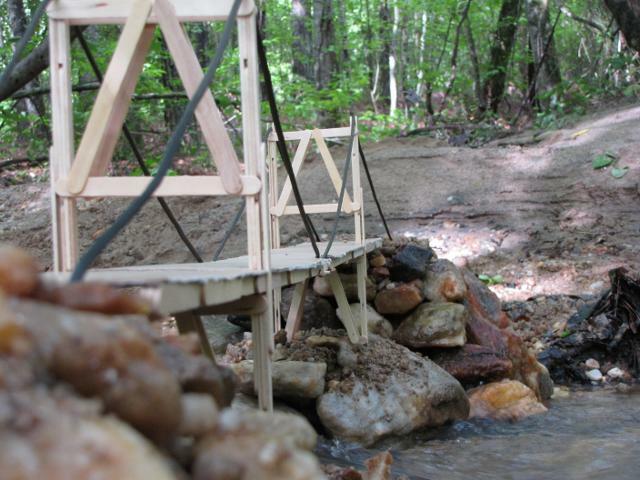 This model suspension bridge uses popsicle sticks as the main building material. 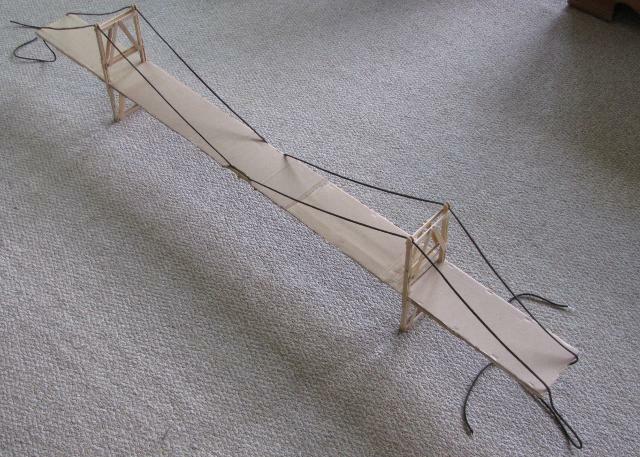 The decking is cardboard, and the “cables” are 550 parachute cord (military surplus). 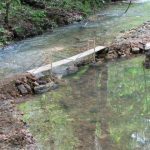 Here is the video of the bridge being tested to failure. I have two different angles showed right after each other. 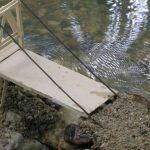 I think this video is very enlightening as to how a suspension bridge reacts to a load. 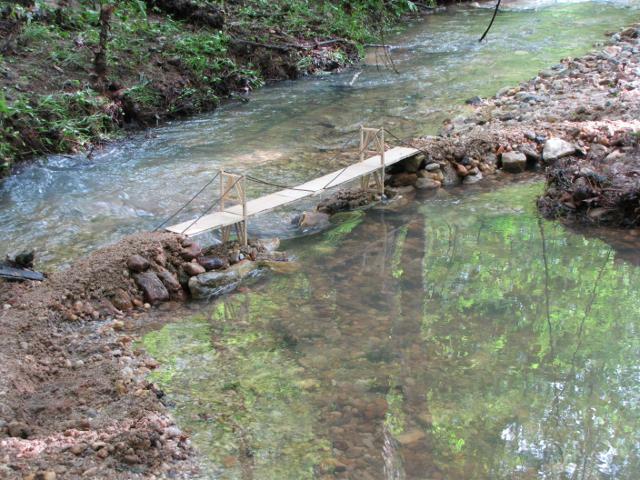 It appears that the bridge failed due to uneven loading. The weights leaned to one side, and I over-corrected as I kept adding weights. I did not come up with a good method of securing the cables to an anchor. 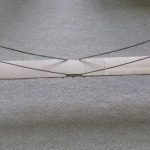 You will notice in the movie that the ends of the bridge lifted up as the middle bent down, until a certain point where the ends of the deck pressed up against the cables themselves. If I were to do this again, I would have the cables already pressing down on the ends of the deck to help secure it in place. 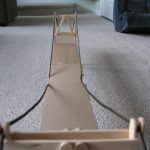 I think this would provide much better support to the bridge rather than what I did. 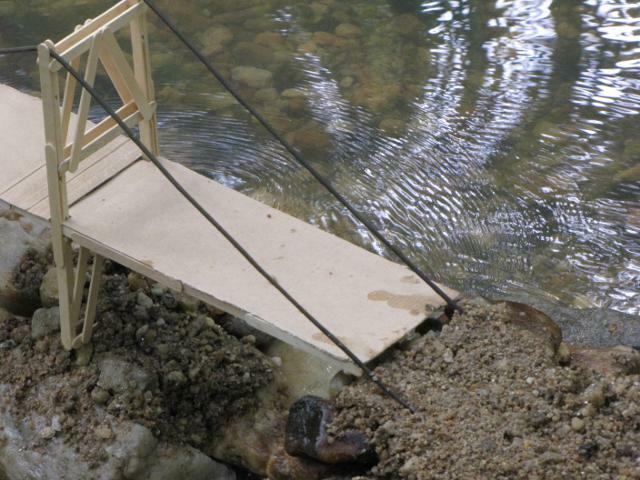 This suspension bridge was very flexible, as you can tell from the video. 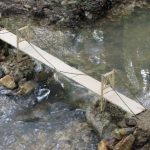 I read an article about building model suspension bridges that said it was difficult to get them flexible enough. Also, I did not have any hangers (vertical cables hanging off the main cables) on this bridge. I did not make any mostly because of the great difficulty in making them even and I did not know a good way to attach the hangers to the main cables. In real life, the cables are metal and have metal clamps and other devices that make this process easier. But I was using parachute cord. 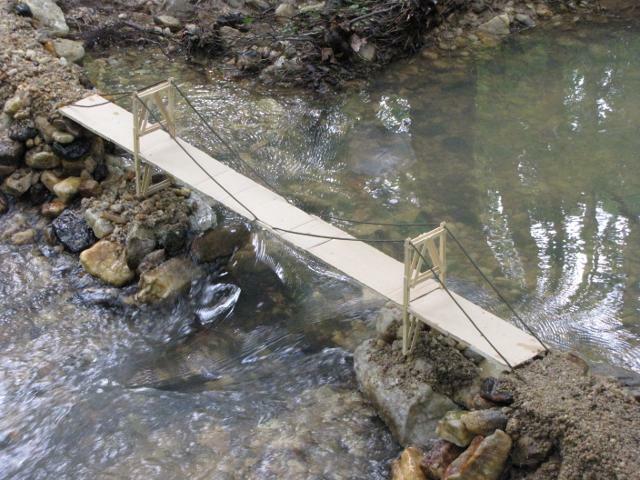 I have been given to make a suspension bridge 2 n i am workin on it! What would you recommend using to cut the popsicle sticks? I tried scissors and I also tried a box cutter, but neither of them seemed to be effective. If there is something you used that worked, what is is? I use a little craft saw blade. I have heard that little fiskar shears work well, but have not tried it myself. I’m trying to figure out a way to make one strong enough for a model train that is HO gage, i would like it to be wide enough for to tracks. Thank you very much for the inspiration! 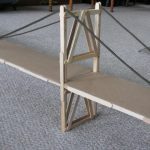 i have to know the complete steps of designing popsicle sticks suspension bridge.. Please? how did you attach the string? Good question. I had hard time knowing how to attach the strings. On the bridge itself I simply fed the cord through the deck popsicle sticks in the center of the span. On top of the towers the cords are not attached at all, but just slide through grooves that hold them from sliding off. To anchor the cords down on the ends of the bridge I used lots of weights from wood and cement blocks. 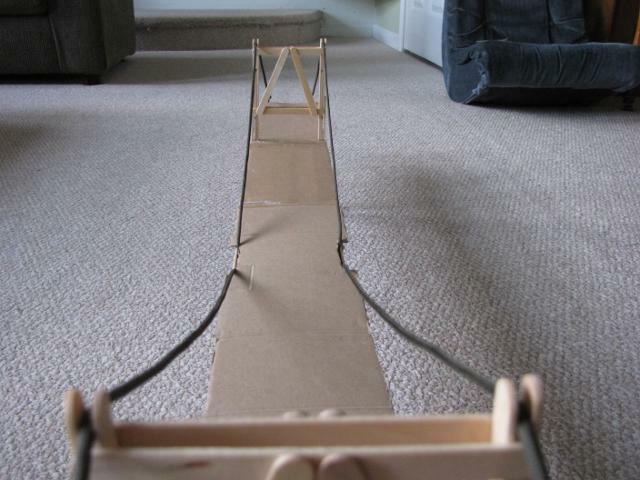 i’m doing a science fair project and i have to create a suspension bridge. Hoe did you construct this one? This bridge is sick man!!!!!!!!!!!!!! 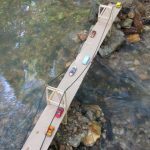 !……I have a project about bridges, me and my partner Carolina are doing a Suspension Bridge and we’re gonna try to do this! !………..It’s really cool how you made it! me too! 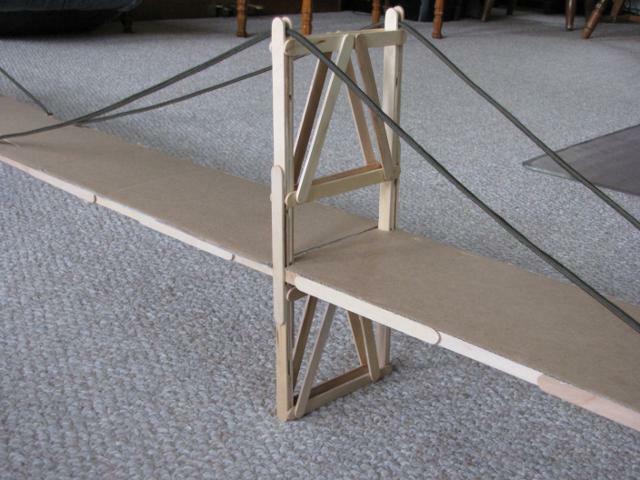 me jake and tom are building a suspension bridge and we would love to use your model!!!!! we’re too stoked about it! That’s sweet Garrett, I am stoked you built it. how many popsicle sticks did you use? Wyatt, I used 64 sticks for the deck, 7 sticks to connect the deck, and 76 for the towers. That is a total of 147 popsicle sticks. 56 queries in 0.514 seconds.